Further to the Romantic era, during which the prestige of the male dancer had become sorely tarnished, the honour of restoring all its glory must essentially go to Gustave Ricaux, thanks to whom we recovered grand technique, more especially in pirouettes, tours en l’air, grande and petite batterie. To fully grasp the importance of this Master’s contribution, and the weight of his responsibilities, one should recall here that for over twenty years, he was sole teacher for men both at the Opera School, and in the Company. He thus followed his pupils’ career from the day they entered the School, to the day their brow was adorned with the laurel wreath of Étoile. The first lessons I took with him, were in 1951, just after I had joined the Opera. The bulk of the troupe was off touring South America, with only a few dancers left behind at Paris, including the character artists, and two young recruits – myself and Michel Dussaigne. We had the great good luck to be accepted by Ricaux to work alongside our elders. His name in the theatre was Sébastien Coline. My comrade Michel Dussaigne was a very fine danseur noble, and blessed with an excellent technique. Together, year after year, we were promoted, until after four years, we were reached the rank of Grand Sujet. That year was 1955. I seize the opportunity to bow to him. Highly organised, methodical, four-square in his beliefs but of the utmost integrity, Gustave Ricaux, our Master, pulled no punches when it came to punctuality. He would suffer no latecomers. Once the hour had struck, he would turn the studio key in its lock. Our lessons took place in the Rotonde Zambelli [in the Palais Garnier]. I recall the experience with awe and emotion. We did our very best to live up to the luck we had drawn with the long straw! The rigour he insisted upon bowled us over, just as we puzzled our brains at the wonderfully-complex petite batterie, a trait very peculiar to the French School. Although lasting but an hour, his class certainly covered ground. According to the custom of the day, the barre was short, 18 minutes at most. Each teacher had his own barre, but Ricaux’ was highly efficient, rational and got us quickly and thoroughly warmed up. The first exercise was grand battement arrondi, four times en dehors and four en dedans, each battement being followed by plié à la seconde. Launching into class with an exercise so taxing to the muscles would raise many an eyebrow today, but as it happens, rather than preparing for class by static stretches, as is today’s practice, we would already have warmed up and got ready to dance through movement. Overall, the class structure was simple but utterly logical, and focused on the crux of the matter. The centre was according to tradition. The basic steps were given in séries, i.e. executed several times over; it is my firm belief that this repetitive work allows the dancer to become truly aware of what the movement actually is, and thus, ensure steady progress. Then there were steps that we performed weekly on a certain Day of the Week, such as grandes pirouettes à l’italienne on the Wednesday, or contretemps cabriole en arabesque on the Thursday. The petite batterie was quite tricky, swift and complex with many pas de liaison (linking steps). As for the big jumps, Ricaux would deal with everything that male technique requires, and thus devote a good deal of time to mastering tours en l’air. I should add that he often had us execute 16 changements de pied fondus, i.e. with a plié in fifth going right down, a very tough exercise where one has to hold one’s back properly; it loosens up the knee-joint, and lends tremendous strength to the thighs. Although exhausted as class ended, we were well aware that here was teaching that rested on a firm foundation. A few months later, Monsieur Ricaux resigned from the Opera. The reason was purely administrative. As it happens, his pension, that included the years in military service during the Great War, was larger than what he earned in salaried teaching. He therefore carried on teaching, but privately. Which is how Michel Dussaigne and I decided to pursue our studies with him, but privately. That private lesson, which took place on the Thursday, was given in a small studio rue d’Amsterdam just over the Cabaret Monseigneur. Although the Master, by then rather elderly, taught seated, nothing slipped his notice, and he expected proper fifths and placement in movement. Whenever a pirouette flopped, he would rise, place his bamboo stick on a very precise spot, and as though by miracle, the pirouette would come off! His eye was infallible and his remarkably accurate corrections, full of good common sense. Those lessons left an imperishable imprint, and so, in my own teaching today, I strive to pass on both his method, and the spirit that informed his pedagogy. 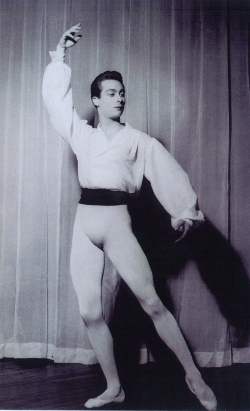 Nor should one forget what a superb dancer was Gustave Ricaux himself, winner of the Concours de Varsovie. While Nijinsky was legendary for vertical elevation, Ricaux’ elevation was de volée. His double-cabrioles en arabesque in the Divertissement of Gounod’s opera Roméo et Juliette are remembered to this day at the Opera. Only very recently, I learnt from his grand-daughter that Ricaux, who spoke German fluently, was an Intelligence Officer during the Great War, and rendered France eminent services. By the way, Albert Aveline, who had also been mobilised during the Great War, was decorated with the military Légion d’Honneur. Gustave Ricaux taught from roughly 1930 to 1950, and trained a veritable battalion of great dancers, so many indeed, that one can scarcely cite all their names. However, I shall seize the occasion to celebrate his leading disciples, setting out their names in chronological order. Serge Peretti, Yves Brieux and Paul Goubé, then the exceptional Jean Babilée who, like Roger Fenonjois, could beat entrechat-dix, Roland Petit of course, Serge Perrault, Daniel Seillier, René Bon, Raymond Franchetti - himself a great teacher who diligently passed on his Master’s store of knowledge - Michel Renault, Serge Golovine, Pierre Lacotte, and finally Attilio Labis who took some lessons with him, without forgetting the Étoile Claude Bessy who profited from his teaching as well. The Dance in this country, and the Paris Opera, owe a great deal to our Master Gustave Ricaux, who will go down in history as one of the greatest pedagogues of the Twentieth Century. Gilbert Mayer was born in 1934 at Geneva, where he took his first dancing lessons. 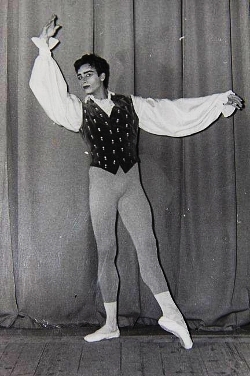 A pupil at the Paris Opera School from 1948, he later joined the troupe and was appointed Premier Danseur in 1961. In 1970, he was appointed professor to the corps de ballet and to the Opera School, where he continued to teach for over thirty years. Guest teacher in the world’s leading schools and troupes, from 1985 to 1991 he acted as Artistic Advisor and Dean at the Geneva Conservatory’s Dancing School. He has also been chargé de mission for the Association française d’action artistique (AFAA). Gilbert Mayer is Chevalier in the Ordre National de la Légion d’Honneur, Officier des Arts et Lettres, Officier des Palmes Académiques and Médaille de Vermeil de la Ville de Paris.